The conceptual basis and design of the synthesiser is quite different from traditional television equipment, whilst still encompassing their functions. Firstly, the unit combines within itself many functions normally carried out by separate pieces of equipment, notably the functions of switching, mixing, special effects and their associated electronics and sync pulse generation and encoding. Secondly, the unit is designed as an instrument equivalent to a musical instrument or electronic music synthesiser. All controls are of high quality and good "feel", and are all easily within reach of a single operator. Thus, for the first time, a single person might perform the functions of director/ vision mixer/ special effects operator/ even engineer. The operator has total visual control of the parameters of all the studio sources, which allows for greater creative freedom than has previously been possible. Because of these possibilities the synthesiser is particularly suited to live television production or live video performance (which is how it is used by its originator). To assist in this type of work the unit is fully portable and may be supplied in a flight case. It may also be used as a simple straightforward mixer in situations which do not call for complex visual control, and it is without doubt the ideal unit for anyone wishing to add some colour facility to an existing monochrome studio without excessive initial expense. Colour cameras could be added at a later stage. It is an ideal de-luxe special effects unit for a well equipped colour studio as its technical performance is quite compatible with broadcast standards. It is also an ideal unit for art and design oriented studios, those who need to correct the parameters of their colour signals, those who need an instant verification of how images look when subjected to modification of contrast and colour and many other applications. The Videokalos Colour Synthesiser is designed by Peter Donebauer and Richard Monkhouse after several years of development aimed at providing the most versatile possible video image processing instrument to a high technical standard and at a sensible price. The unit is hand built and thoroughly tested and provides creatively open-ended possibilities in the production of colour television programmes. Although titled a synthesiser this instrument is really a versatile video image processor and mixer. Most television mixers are just sophisticated switchers allowing cutting and mixing between chosen sources, and often a degree of special effects in terms of simple colourisation or keying. These units do not allow one to control and modify the parameters of the electrical signals of all the sources. These functions are normally delegated to the engineering section remote from the vision mixing desk. 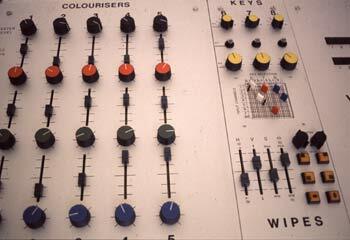 The Videokalos Colour Synthesiser allows this degree of control of ones input sources. Multiple signals may be colourised independently. Starting with monochrome video inputs, one may synthesise red, green and blue signals from each of them, each varying in gain, positively or negatively, and variable for black level or pedestal. Alternatively, red, green and blue colour signals from cameras or VTR via decoder may be fed in with the same degree of precise control either for correction or modification of the original source. Five input channels may be independently treated in this way. With these controls normalised the unit may be used as a standard monochrome or RGB mixer. One PAL or NTSC decoder is built into the unit for composite inputs. 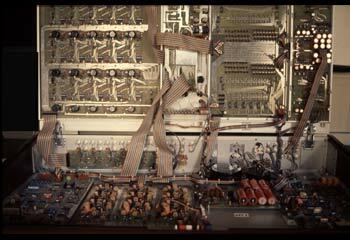 The main "mixing" area of the unit consists of an eight-input four-bank RGB switcher (ABCD banks). All switching is vertical interval, and the switches incorporate LED indication of the active channel. Mixing and fade-to-black takes place between the A and B banks, and independently between the C and D banks. The output of the AB banks is encoded to standard specification (switchable between PAL and NTSC), and also provides RGB outputs for SECAM. The twin outputs of the CD banks are RGB. These may be used for preview, special effects processing external to the machine or for re-entry to the AB banks. This re-entry is not normally required as channels 6,7 and 8 are all what would normally be called "special effects" channels, allowing independent wipes and keying on all three channels. Channels 1-5 are for inputs through the colourisers. All inputs must be synchronous. Inputs to any channel may be looped through to the next, allowing up to five independent channel variations of a single input if desired as well as variation on each input channel itself. The keying potential of the synthesiser for special effect work is very wide indeed. Three independent keys are provided on channels 6, 7 and 8. A 22x22 hole patchboard is used in conjunction with the keys. Each key may select as its triggering source any of the five monochrome inputs, any of the fifteen RGB colouriser outputs, the other key channel outputs, the wipe generator or an independent external key input. It may also select any combination of RGB outputs of the colourising section, which, by varying the balance of RGB at this point allows full chroma-key off any colour of an original scene (viewed by colour camera). Three independent chroma-keys are thus possible. One may also key off a combination of channels, equivalent to keying off a mix of two to seven channels simultaneously. On to each side of the key may be placed any combination of R,G or B from any source in the synthesiser including the other key outputs. By using the patchboard the three key channels may be ganged sequentially and set for different key levels. The result of this is to provide up to four levels of colourisation of a single image, with full analogue video information within each level rather than the block colour effect usually seen. As positive/negative colour mixtures are possible within each level a very complex colouring potential is achieved. The wipe generator is selected on one or more of the key channels. Horizontal, vertical and corner wipes are possible in all directions. Also a variable wipe consisting of two ellipses, variable from straight bands in one plane through ellipse and circle to a band in the other plane. The interference area between the two ellipses give the wipe waveform such as circle, cross, "flying saucer" etc. 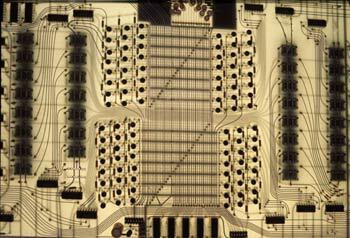 The synthesiser contains its own sync pulse generator switchable from PAL to NTSC with a crystal change. This provides all internal needs and gives outputs of the seven colour pulses at 75 ohm line level. It may thus be used to drive an entire studio in monochrome or colour. Alternatively the SPG may be genlocked to an external source. This is necessary for playback of a VTR through the unit for processing or mixing with other sources. It is also useful where the unit is used as an additional facility in a studio driven from other sources, e.g. broadcast. The genlock functions well on helical scan machines, including portapacks. Technically, there is an immediate vertical lock with horizontal phase locked loop. The sync pulse generator has a free running sub-carrier. Other facilities in the synthesiser include a colour bar generator which is used for interior line-up or for exterior line-up of equipment such as monitors. Also outputs are provided of oscilloscope drive waveforms. This provides a display on a normal oscilloscope of the RGB components of the output signals. This is particularly useful when the colourisers are being used creatively, but also assists in more straightforward situations.